You should definitely take Majik's advise and switch the orientation of the "H" and "A" on the spelt out logo to match what you have in the just "HA" logo. Or vice versa, just make them match. Also, I would like two "squarish" HA logo vinyls please so I can spell "Haha." I'm not trying to reinvent the wheel. I was just trying to redo the graphics because they were in compressed JPG format. I do see the point though and I may do it. I don't think putting the line through the H would be better though. I'll work on that tomorrow. There is a contest running right now for designing the site headers. 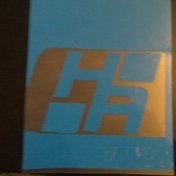 I co-own a vinyl cutter, so if you wanted cut vinyl decals I could see how much of a PITA it would be to do a run. Here's a quick proof-cut, still some tweekage needed, and of course the other colors would need to be cut/correct colors used.